The presidential candidate hoists a picket sign and joins the march of labor. Labor Day parades, marches, rallies, and picnics used to attract presidential candidates of both major parties. Since the Republican Party has in recent decades embraced the extreme anti-worker and anti-union policies of the Koch brothers and other billionaire campaign donors—abandoning its historic roots and confirming its current allegiance to multinational corporations—the party’s presidential contenders have made less frequent appearances on the Labor Day circuit. But for Democrats (along with Greens, Socialists, and progressive independents), Labor Day is still a time for showing solidarity with workers. This year’s Labor Day calendars in key states are packed with appearances by the Democrats who are seeking their party’s nomination—and who might do so. Vice President Joe Biden, who is still wrestling with the prospect of a 2016 bid, was headed for the swing state of Pennsylvania, where he was set to march with AFL-CIO president Richard Trumka in Pittsburgh. Former secretary of state Hillary Clinton planned stops at the Quad City Federation of Labor’s Salute to Labor chicken fry in Hampton, Illinois, and at the Des Moines-Henry County Labor Council picnic and the Hawkeye Labor Council celebration in the first caucus state of Iowa. Heading for additional events in Iowa was former Maryland governor Martin O’Malley, who planned to attend the Jackson County Labor Day Meet and Greet in Maquoketa and the Dubuque Labor Council Labor Day Picnic in that riverfront city. 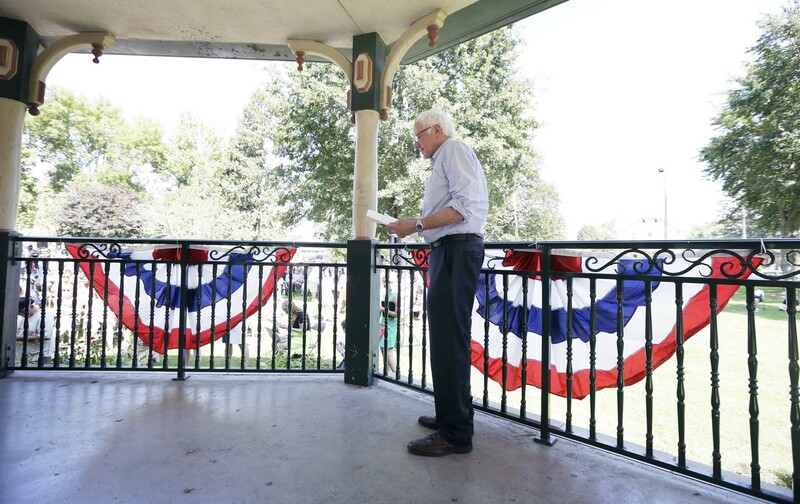 Vermont Senator Bernie Sanders had a busy schedule set for the first-primary state of New Hamsphire, where he was set to begin the day by keynoting the New Hampshire AFL-CIO’s Labor Day Breakfast in Manchester. But the real measure of Sanders’s Labor Day commitment came before the holiday weekend, when he veered off the campaign trail last Friday to join a Bakery, Confectionery, Tobacco Workers and Grain Millers International Union Local 100G picket line outside the Penford Products plant in Cedar Rapids, Iowa. There, amid chants of “Hey, hey, ho, ho, union busters have got to go” and “Hey, hey, ho, ho, the war on workers has got to go,” Sanders walked the line on a scorching late-summer afternoon with workers who are fighting to maintain basic fairness on the job. Since the Penford plant was purchased earlier this year by a multinational corporation that is not headquartered in Iowa, Ingredion, workers at the facility—which began as the Douglas Starch Works in 1890 and has employed generations of Cedar Rapids families in processing for food industries—have faced mounting pressure for concessions from management. They are now locked in a bitter contract dispute. For Sanders, who has a long history of joining union picket lines in Vermont and around the country, there was no doubt about which side he was on. Sanders drew loud applause from the members of the historic grain miller’s local in the eastern-Iowa city, and praise from Bakery, Confectionery, Tobacco Workers and Grain Millers International Union president David Durkee for “[taking] time out of his extremely busy schedule” to show solidarity with the Local 100G members. “Bernie Sanders has been a voice for working people all his life. He is a man who never gives up and who always makes decisions based on what is good and right for the average American,” said Durkee, whose union has not made an endorsement in the 2016 presidential race. Sanders acknowledged the reality of his presidential run. But he reminded the workers that he does not merely show up on Labor Day weekend.